Once released into our environment, genetically engineered (also called genetically modified or GM) organisms are difficult or impossible to control or recall. Each release of a GM organism is an experiment – some are more controlled and controllable than others. GM contamination is the unwanted escape and spread of GMOs or genetic material from GMOs to non-GM plants, animals and foods. This dispersal can occur through a number of ways, including pollen spread and seed escape, and mixing of food and feed. GM contamination is living pollution that can self-replicate. Such contamination can have negative environmental, social and economic impacts. So far, farmers have been the first to pay the price of GM contamination. There have been escape events in Canada with GM canola, flax, wheat and pigs. Some escape events occurred with GMOs approved by our government (canola and flax), and others with experimental unapproved GM plants and animals (wheat and pigs). Some were isolated incidents (wheat and pigs), while others are widespread or ongoing contamination cases (canola and flax). 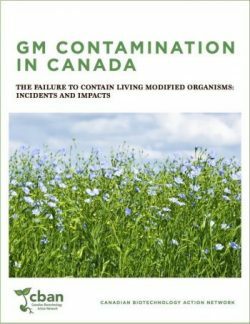 The new report GM Contamination in Canada – The failure to contain living modified organisms: Incidents and impacts details, for the first time in one place, all the known contamination and escape incidents in Canada that have occurred with genetically engineered (genetically modified or GM) crops and animals, and their impacts. The report shows that once released into our environment, genetically modified organisms (GMOs) can be difficult or impossible to control or recall. It also discusses how human error, biology, pollinator and wind movement, extreme weather events, and other factors make GM contamination predictable. The diverse incidents of GM escape and contamination in Canada show that the risks cannot be managed by current government regulation nor through industry-developed best practices. The report is published by the Canadian Biotechnology Action Network (CBAN) and the Organic Agriculture Protection Fund (OAPF) of SaskOrganics. Contamination of non-GM crops with genetically modified traits can take place in a number of ways, and at a number of links in the food chain. It can be the result of natural processes, or human activity. Cross pollination: Pollen from GM plants can spread to non-GM plants, carried by the wind, insects, or other animals. The probability and the distance over which this contamination can take place differs from one species to another, and depends on how the plant is pollinated, how far its pollinators can travel, and other aspects of its biology. GM volunteer and feral plants can also perpetuate cross-pollination. Seed escape and mixing of food and feed: GM seed can escape and mix with non-GM seed during seed production or through the use of farm equipment, during transportation and storage, and even on clothing and footwear. Seed spilled during transport can lead to feral or volunteer GM plants growing along transport routes. Domestic or wild animals can also spread GM seed. GM and non-GM crops can also mix during storage and milling, and GM and non-GM food and feed can mix during processing. Field trials of GM crop plants and trees pose a contamination risk. The Canadian Food Inspection Agency (CFIA) regulates field trials and refers to these tests as “confined environmental release”. In Canada, the federal government provides a list of field trials per province for past years, but the exact locations of the trials are kept confidential. This lack of information means that farmers who are near GMO field test sites are unaware and therefore unable to implement their own mitigation measures to protect themselves from GM contamination. 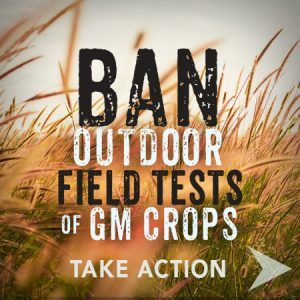 In 2018, in the wake of GM wheat escape, the National Farmers Union reiterated their 2001 demand for an end to open-air GMO field tests. The NFU also asked for, but was denied, the location details of all past and current GM wheat trials. The economic consequences of GM contamination in Canada have included the temporary or permanent loss of export markets, lower crop prices in the short or long-term, the loss of access to grow a particular crop, and the loss of some farm-saved seed. Widespread GM canola contamination in Canada has meant that most organic farmers have lost the option of growing canola. GM flax contamination temporarily shut down export markets and lowered crop prices. It shifted Canada’s flax market to a lower priced one. GM alfalfa commercialization in Canada poses an immediate contamination threat to organic farming systems and other farm operations. There are new and proposed GMOs that pose significant risks of escape and/or serious consequences if escape occurs. Furthermore, some proposed GMOs are specifically designed to be released into the wild, such as the GM American chestnut tree, or to deliberately cross with wild populations, such as the gene drive mosquito. Read more details on the impacts of GM contamination in Canada, in CBAN’s 2019 report. Contamination of canola due to pollen and seed escape from GM canola in Canada compromised seed purity to such a degree that, within seven years of introducing GM canola, seed growers no longer guaranteed their conventional canola seed as GM-free. Organic grain farmers in the Prairies stopped growing canola due to high levels of GM contamination and attempted to sue companies for compensation for the loss of this crop. GM canola has been widely adopted in Canada – approximately 97% of canola grown is now GM. GM canola prompted Monsanto’s well-known legal pursuit of Saskatchewan farmer Percy Schmeiser for patent infringement. Schmeiser maintained that the GM canola found on his land fell out of trucks on the road, but Monsanto alleged that Schmeiser knowingly used its patented GM trait without purchasing the seed. In 2004, the Supreme Court ruled that Monsanto could claim patent rights over GM plants, regardless of where they were found or how they got onto a farmer’s field. Canola contamination also spurred the only legal action brought forward by Canadian farmers seeking redress for GM contamination. In 2002, the Organic Agriculture Protection Fund (OAPF) of the farmers’ organization now called SaskOrganics, filed for certification of a class action suit seeking compensation from Monsanto and Bayer (formerly Aventis) for GM canola contamination. The OAPF held that the loss of canola as an organic crop robbed organic farmers of a high-paying and expanding market. The class action was not certified in Saskatchewan and the Supreme Court would not hear the appeal, and so, in 2007, the legal action ended without its merits being heard in the courts. In 2009, Canadian flax was found contaminated with a genetically engineered flax variety called “Triffid”. The GM flax had been developed in Canada but never sold on the market to farmers. Represented by the Flax Council of Canada and the Saskatchewan Flax Development Commission, farmers convinced the university to deregister the GM flax variety in 2001, stopping the seed from being introduced into the market. However, almost 10 years later, the GM flax was detected in Canadian flax export shipments and reached at least 35 countries that had not approved it. Click here to see the timeline of events. Canada is a world leader in flax production and export, and the economic consequences of the contamination were profound. As a result of pedigreed flax seed contamination, flax farmers lost important export markets in Europe and Asia, some lost their saved seed, and flax acreage and price dropped. Canada is still struggling to regain its most important flax export market, Europe: at the time of contamination, 60% of Canada’s flax exports went to Europe but this number was only 12% in 2017. Canada’s flax market shifted from a high-priced food market to a lower-priced industrial market. The total cost of the contamination incident to the Canadian flax industry is estimated at $29.1-million. Read more about the costs in CBAN’s report. There is no GM wheat approved or commercialized anywhere in the world, but in 2018, the Canadian Food Inspection Agency announced that several unapproved GM wheat plants were found on an Alberta roadside. The government could not determine how the GM trait got there 17 years after it was last field tested in Canada. This was an isolated incident and the first escape event with GM wheat in Canada. The GM wheat did not enter the food system. “We may never know how this GM wheat came to be present on an access road.” – CFIA. The herbicide-tolerant plants were discovered in 2017 when roadside spraying to control weeds failed to kill several wheat plants. The plants contained GM event MON71200, which had been field-tested by Monsanto from 1998-2000 in Alberta, Manitoba and Saskatchewan. The Canadian Food Inspection Agency (CFIA) could not determine the cause of the escape. The CFIA could neither rule out nor establish a direct link to the previous field tests: “Given the passage of time and large distances involved, there is no evidence that would explain how or if the current GM wheat finding is linked with a previous trial.” However, the CFIA did determine that there was no connection (no genetic match) to the previous three contamination incidents in the US with Monsanto’s GM herbicide-tolerant wheat. Read more about the wheat escape event here. There have been two separate contamination incidents with experimental, unapproved genetically engineered pigs in Canada, one from a university and the other from a private company. In both cases, the unapproved GM pigs entered the food system. These incidents reiterate the predictable problem of human error as a cause of contamination. In 2004, three experimental genetically engineered pigs from the now-defunct Quebec company TGN Biotech were accidentally turned into chicken feed instead of being incinerated. In 2002, eleven GM “Enviropig” piglets in experiments at the University of Guelph in Ontario were accidentally sent to a meat rendering plant and turned into animal feed instead of being destroyed as biological waste. Alfalfa is the first perennial GM crop approved for growing in Canada. Since 2016, a small amount of genetically modified (GM or genetically engineered) alfalfa seed is sold in Eastern Canada. Alfalfa (hay and pasture) is high-protein feed for animals like dairy cows, beef cattle and sheep, and is also used to build up nutrients in the soil, making it particularly important for organic farming of grains and vegetables. Contamination from GM alfalfa would ruin export markets for alfalfa products, and threaten the future organic food and farming in Canada. GM alfalfa contamination has been found in US exports (2013 & 2014) and US government scientists have reported the wide dispersal of feral GM alfalfa. The biology of alfalfa and the ways that alfalfa is used make it particularly susceptible to contamination through seed escape, cross-pollination, and through the proliferation of volunteer and feral alfalfa. Alfalfa seed is very small and the likelihood that seed may spill during planting, transport and harvest is very high. Seed may get left behind in farm equipment or be inadvertently spread by animals. Additionally, “hard seed” in alfalfa can stay dormant and germinate months or years later. The only way to prevent contamination from GM alfalfa is to stop growing it and terminate existing stands. Click here for more information on GM alfalfa and the contamination risk. Rather than take measures to prevent GM contamination, the biotechnology and seed industry is advocating for policies that accept contamination. The Canadian government has committed, via the 2018 trade agreement with the US and Mexico, to developing a “Low Level Presence” (LLP) policy that will allow some GM contamination in imports to Canada. the contamination comes from a country whose regulatory system Health Canada considers trustworthy. This policy would mean that Canada’s safety regulation of GM foods would no longer be applied to all the GM foods that Canadians eat. Low level presence would replace the global norm of zero-tolerance for contamination from GM events that have not been approved by domestic regulators. If Canada’s trading partners accept LLP, it could remove the most immediate negative economic impacts of GM contamination in global trade. A global LLP policy would go a long way to realizing the industry’s goal of harmonizing regulations across the world or simply accepting the regulatory decisions of other countries. As the lobby group for pesticide and GM seed companies, CropLife Canada, proposes: “Canada could consider and recognize the conclusions of risk assessments completed in other countries with reliable regulatory systems.” Read more about LLP here.